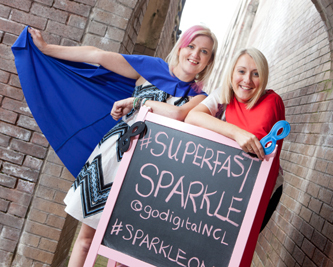 A NEWCASTLE company is adding extra sparkle to its creative communications with the help of Go Digital Newcastle’s free programme of support for businesses in the city. Nicola Little and Jennifer Robson founded PR firm We Are Sparkle in 2013 and are based at Riverside Studios in the city. Digital channels are a major part of their business, and when they heard about the free masterclasses and workshops available from Go Digital Newcastle, they jumped at the chance. The free sessions – worth up to £1,000 if they needed to be paid for – include one-to-one help from an expert advisor. Training sessions range from marketing to social media and website skills, as well as business development events. Nicola said: “We heard on Twitter about the free support sessions available to businesses, and we started by joining a session on how to get the most out of your website. “We’ve been running websites for six years, but we believe you should always keep on training and updating. “We picked up a number of useful tips. The session has informed what we plan to do when we relaunch our website, because it’s helped us look at it from a different point of view and think about who the website is actually for – our customers. Go Digital Newcastle is an initiative being run by Newcastle City Council with the help of government funding. The initiative is providing a welcome boost to eligible small and medium-sized businesses, charities and social enterprises in Newcastle, North Tyneside and Gateshead. They can apply to Go Digital Newcastle for a connection voucher worth up to £3,000 to get connected to superfast broadband. The businesses choose their own supplier, and pay the on-going charges and any VAT. The Go Digital Newcastle business support programme used by We Are Sparkle and funded by ERDF, aims to help businesses take full advantage of the Internet – and eligible companies can also apply for up to £2,000 in funding for related IT equipment. 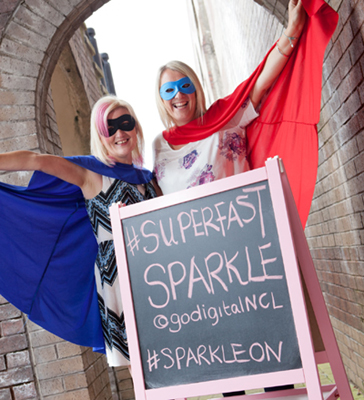 Nicola was a speaker at the recent Go Digital Newcastle Superfast Summit for businesses, and We Are Sparkle is now applying for one of the free connection vouchers. Cllr Michael Johnson, Newcastle City Council Deputy Cabinet Member for Skills, Business and Enterprise, said funding and help was now available to thousands of eligible SMEs, charities and social enterprises in the area. He said: “It’s great to see local businesses like We Are Sparkle making the most of the Go Digital Newcastle connection voucher offer. “They see the huge benefits that superfast broadband can bring to organisations – it means they can connect with their customers more easily, promote their products and services, and save costs by working more efficiently.